Before you learn to trust your intuition, there is a period of time when you can’t distinguish strong desire or fear from intuition. The only way to move through that period is to observe and reflect on yourself and then to take the risk of following what you believe to be intuition and see what happens. And yes, while you are still trying to figure it out, you will mistake your desire for something or your fear of something for intuition, and yes things will happen that don’t make you happy. And you will live through it. And in the end, you will be able to distinguish your intuition from your fear or your hopes because you know yourself so well. 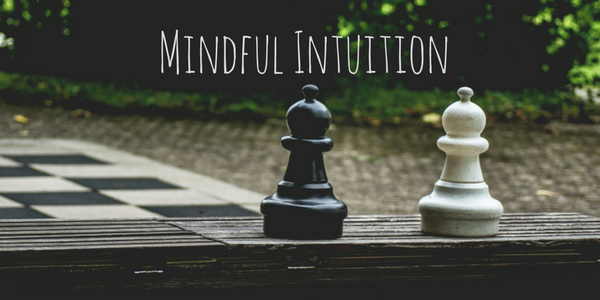 Mindful intuition is the universal cheat sheet for navigating life. It doesn’t mean we will never have a negative experience, some are unavoidable, but we will have fewer. We will be more fulfilled because we are able to live our life with the satisfaction of living for ourselves. We will make decisions and choices that align with our souls instead of someone else’s agenda, whether that person is your spouse, parent, child, boss, colleague, friend, or just societal expectations. Take the time to develop your intuition. Use the practices of mindfulness to do it, be patient while you develop your inner compass. Mindful intuition is worth the effort.